Merkel Hopes Poland Can Satisfy EU Concerns Over Judicial Reform - Integration Through Media ....! 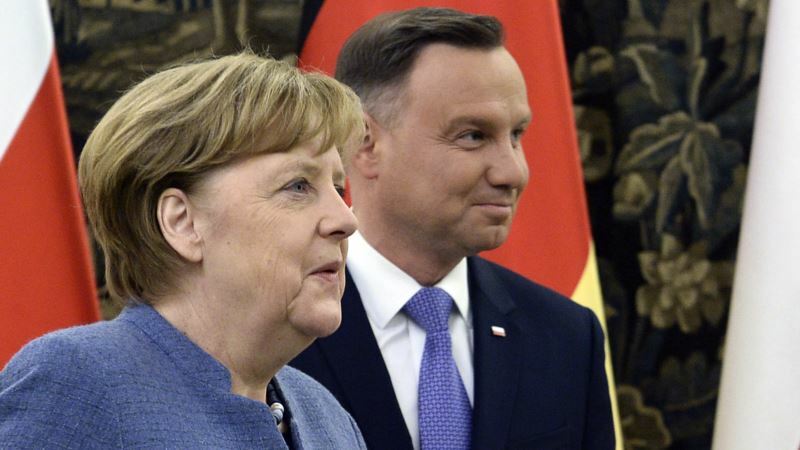 (VOA): German Chancellor Angela Merkel said on Monday she hoped authorities in Warsaw would satisfy Europe's concerns over the rule of law in Poland, as the two countries also faced gaps to bridge over migration and a new gas pipeline. Merkel traveled to Warsaw on her second foreign trip since being sworn in for a fourth term to highlight Germany's commitment to Poland at a time of tension relations with both Russia and the United States. Following a meeting with Prime Minister Mateusz Morawiecki, she said she hoped talks between Poland and EU authorities would be successful. In December, the European Commission launched a rule-of-law procedure – known as Article 7 – against Poland over reforms that Brussels says undermine the independence of the country's judiciary. “I hope that the issue of Article 7 proceedings … can be settled,” Merkel said via a translator at a joint conference with Morawiecki. Brussels has given Poland three months to address its concerns. Morawiecki said Poland had entered a “constructive dialogue” with the European Commission. “I can say that there is a light at the end of the tunnel, that we will reach an agreement,” he said. Merkel must pull off a delicate balancing act – reassuring Warsaw about Berlin's commitment to NATO military spending targets while not backing away from the EU core principles that the European Commission says Poland has undermined. Neither leader mentioned the planned Nord Stream 2 pipeline designed to ship Russian gas to Germany, avoiding transit through Ukraine. It has Germany's approval, but Poland has urged that Western sanctions be imposed on it. Ties between Germany and Poland have worsened since the right-wing Law and Justice Party (PiS) came to power in Warsaw in 2015, with the two countries also at odds over Poland's refusal to take in asylum seekers under an EU-wide quota system. “I am confident that this new federal government will approach the Polish-German relations with new energy,” Merkel said.